When your day-to-day involves a hospital gown, waiting room music, clusters of whirring medical equipment and a series of stern, sympathetic looks from the doctor, it can be tough to find something worth living for. Such is the case for Alan Gates, a cancer patient who’s just been told he has less than a month to live. So it shouldn’t come as a total shock that, when confronted with an armed robbery in progress, Alan takes it upon himself to intervene, carelessly throwing his life to the wind in exchange for the chance to feel something… anything… again. What Alan (and, by proxy, the reader) couldn’t have predicted is the chain reaction instigated by that one selfless, split-second decision. Weighing in at just twenty-two pages, this introductory chapter successfully manages to cover a lot of ground at a breakneck pace without sacrificing clarity along the way. A simple enough concept is partly to thank for that. James Wan’s plot, adapted for the page by Michael Alan Nelson, wastes little time on characterization. Instead, it chooses to spend its time asking a series of increasingly brow-furrowing questions, then jerking the wheel in sudden, surprising new directions. It thrives on that lengthy string of unexpected leaps of faith, asking more questions than it has pages to answer them in similar fashion to the opening act of The Matrix, albeit much less eloquently. Despite its aura of mystery, though, Wan and Nelson’s storyline can be quite blunt and generic at times. Its excessive use of slang during a tense scene in the operating room seems forced and unrealistic, not to mention unnecessary. Later scenes involving a gun-slinging escape from the hospital feel too calm and casual, robbing the moment of its inherent drama. In fact, nearly all of the issue’s dialog comes off as clunky and awkward, difficult to read and even tougher to visualize in a conversational setting. The nameless, faceless enemy that stands revealed at the issue’s climax appears to have arrived directly from the book of late ‘90s action clichés. It’s a story that’s furiously treading in foamy water, taking two steps forward with its gumption and adventurous timing, then two backward with stilted dialog and empty characterization. Piotr Kowalski’s visuals keep up fairly well with the aggressive pace, but fail to deliver a true signature style at any point. His layouts perform very well, slickly moving the action from one panel to the next and pausing at all the right moments. He works a clean action scene, sculpts a few well-designed original characters and maintains a steady beat throughout the issue. Kowalski is just lacking that certain touch of panache which simply can’t be taught. His pages don’t feel entirely alive, nor are they something I could pick out of a sketchbook lineup. They’re fundamentally strong, but ultimately bland and soulless. With a bit more polish and character, his work could easily turn that corner and become something to behold. 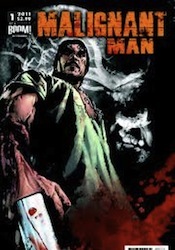 Malignant Man has promise, but seems to be missing a real hook in both its artwork and its storytelling. Alan is a painfully dull lead character thus far, really just groggily reacting to the series of crazed events around him, and while that’s a flaw that could be rectified in future issues, it’s also something that could keep readers from bothering to tune in for them. Flip through it; the first issue certainly isn’t a bad one, it’s just quite vanilla.